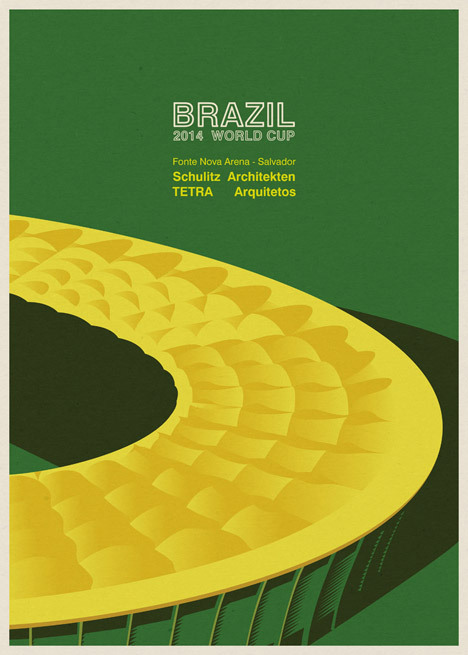 Stadiums currently hosting football matches for the FIFA World Cup 2014in Brazil are captured in these graphic posters by Portuguese illustrator André Chiote. 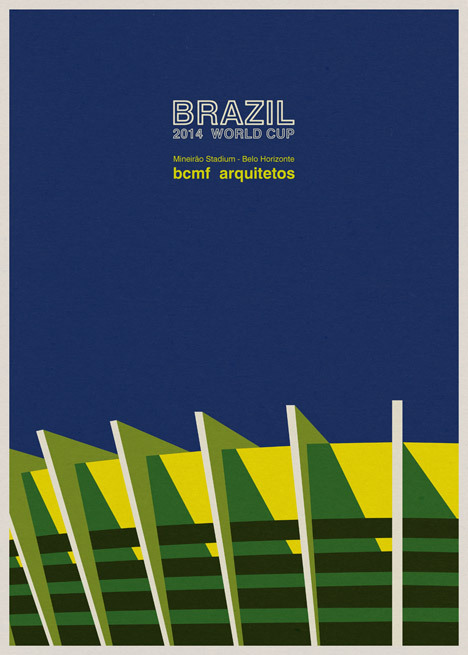 André Chiote has illustrated five of the 12 World Cup stadiums in Brazil, using his signature style that highlights key elements of a building's design with blocks of colour. "If a building (stadium or other kind) has an expressive design, a 'key concept', it becomes much easier to illustrate because you quickly discover what was the aim of the project, and it becomes much easier to communicate it," Chiote told Dezeen. 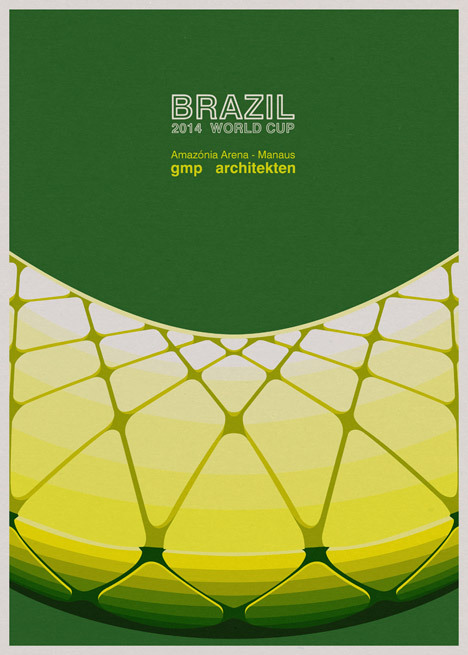 To illustrate the Amazonia Arena in Manaus by GMP Arkitekten, he picked out the diamond grid pattern that criss-crosses the rounded structure. Fernandes Arquitetos' renovation of the 1950 Maracanã Stadium in Rio de Janeiro has been characterised by the pleats on the roof, while the structural fins are highlighted on the 1965 Mineirão Stadium in Belo Horizonte revamped by BCMF Arquitetos. Chiote has emphasised the dimpled roof of Salvador's Fonte Nova Arena by Schulitz Architekten and TETRA Arquitectos, and the slender columns supporting Brasilía's Mané Garrincha Stadium by Castro Mello Arquitetos. 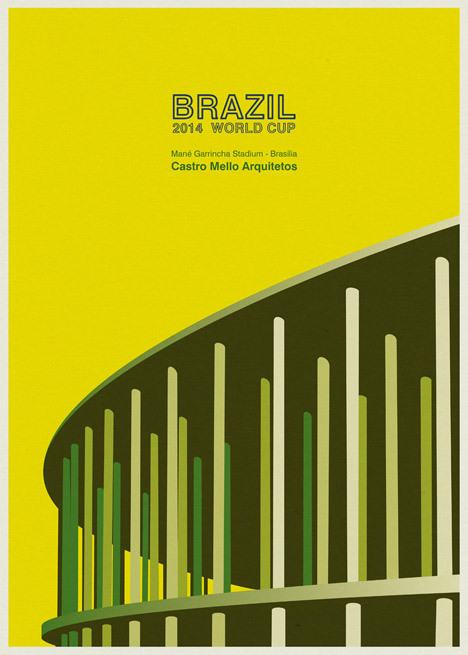 The graphics are coloured with shades of blue, yellow and green, colours found on the host country's flag. "The construction of new football stadiums means, for a country who hosts an event like a World Cup, the statement to the world of its technical, financial and cultural capacity," Chiote said. 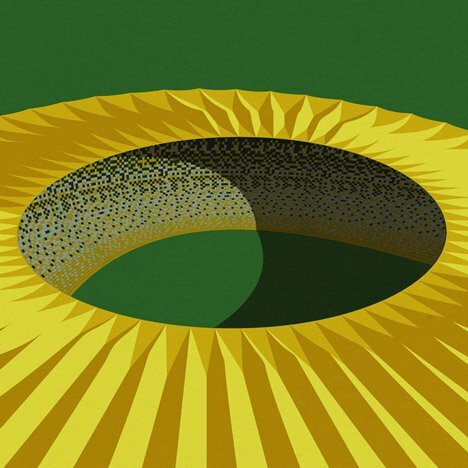 "So, as a national statement, I thought it was an interesting approach to use the colours of Brazil's flag to produce iconic images of some new symbols of that country." 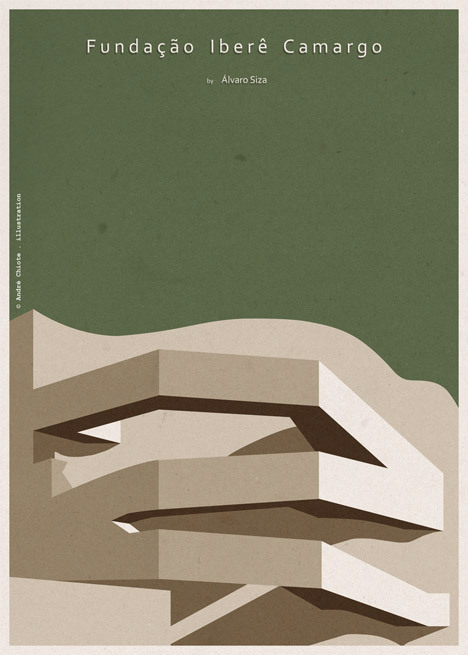 He explained that what interests him about stadiums is "the capacity to become landmarks and city icons". "Also, usually, as they are exceptional buildings, architects and engineers develop innovative designs and technical solutions," he added. 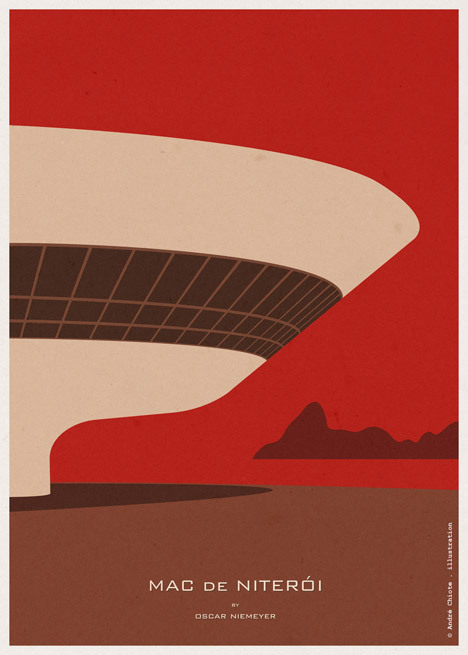 Other Brazilian buildings Chiote has previously depicted include Oscar Niemeyer's Mac de Niterói and Alvaro Siza's Fundação Iberê Camargo. Some of the stadiums' architectural elements reflect a national style found in these other buildings, according to Chiote. 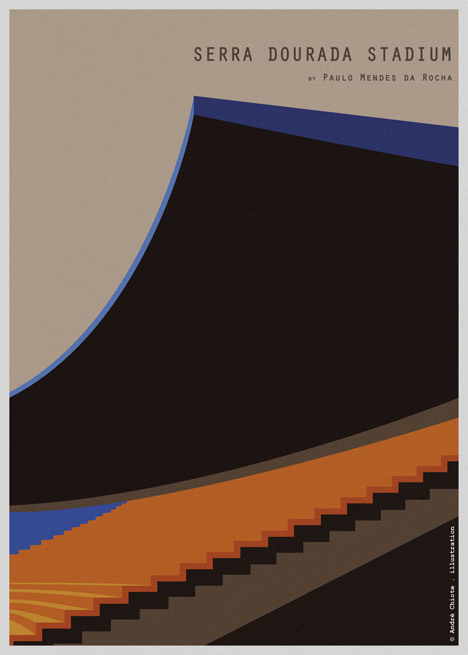 "By their function, stadiums usually have some specific design characteristics," he said. 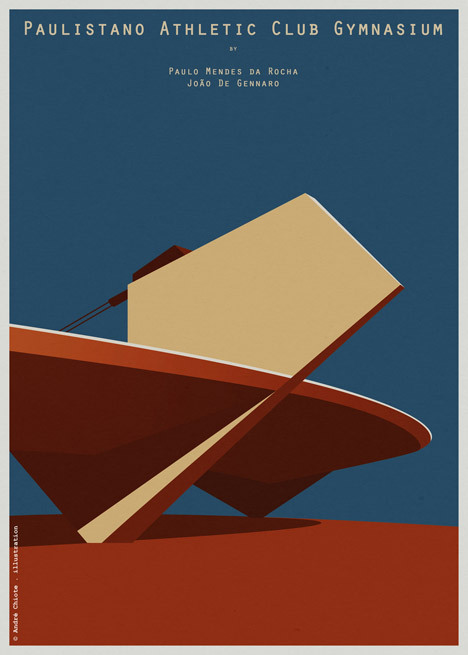 "However, the curve elements and expressive structures, used in the some stadiums, I think are common in a certain Brazilian architecture." 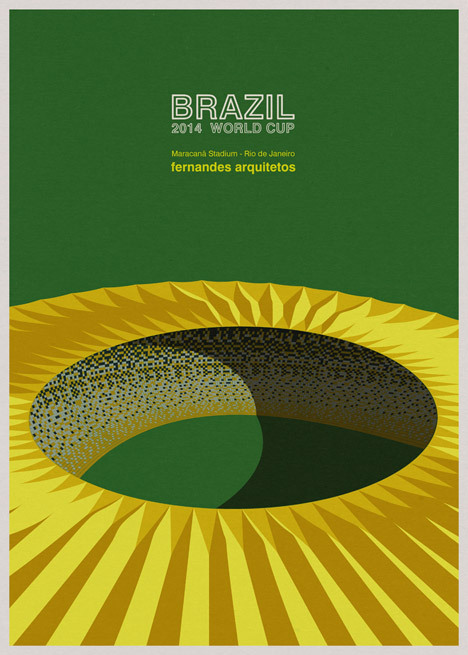 Chiote plans to illustrate the other seven stadiums as the tournament continues. This year's FIFA World Cup kicked off in São Paulo on 12 June and will conclude with the final match in Rio de Janeiro on 13 July.